Steward success is not always about successfully defending members in times of crises. They are proactive in seeking the best circumstances for members; representing your voice within meetings where decisions are made about Workforce Management and Performance Management. Unions are the only negotiating party who work on behalf of members. A success story within Customer Contact is where our Steward (Lorraine Francis) has got into those decision making meetings and tirelessly works on behalf of the members in Customer Contact. How did she get there? 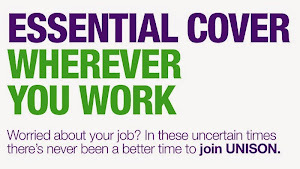 UNISON conducted a survey of members within the Contact Centre. We asked questions about their feelings towards their work and what their confidence is on the current circumstances. Lorraine, represented the data to management and as a result of this effort she has regular FORTNIGHTLY meetings with management to discuss issues within the Contact Centre. Customer Contact Managers have also agreed, as part of being open and transparent, to send her on the 3 day Work force Management training; which, means she is able to have a more informed perspective on decisions to enable her to be in a powerful position when negotiations take place. Respect also goes to the Customer Contact Managers who have listened to UNISON's concerns and acted on them in a positive way. Lorraine considers that she has more input now on anything that may become an issue and affect staff morale and she has an input on they way things are being implemented. 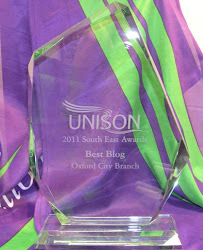 If you work in the Contact Centre and if you are are not a Member please feel free to email or approach Lorraine Francis if you would like further information about UNISON's work at Oxford City Council. If you work in the Contact Centre and you ARE a Member please feel free to contact Lorraine if you are experiencing any issuesat work. If you work in other departments and would like to know more information about who your contact is please email oxfordunison@gmail.com or contact the local branch office at 01865 252522. Have the right to vote at branch committee on Council policy decisions and the direction of YOUR union. Please email the branch secretary Caroline Glendinning at cglendinning@oxford.gov.uk or call the office on 01865 252522. Not really news yet; but a decision will be made very soon about what Oxford City UNISON branch is doing for the festive season. Keep checking; it will be very exciting!